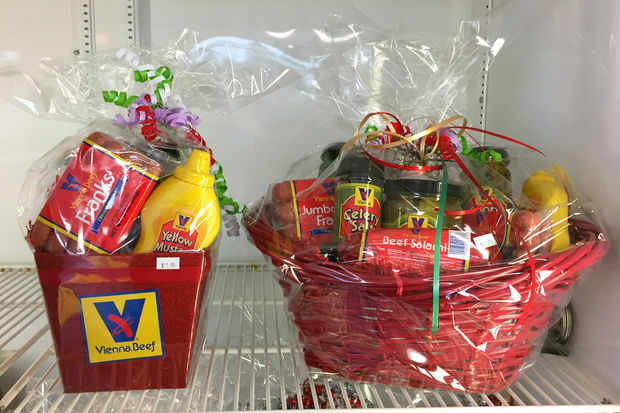 BRIDGEPORT — If you've got an out-of-town relative or friend who's always reminiscing about the glory of a Chicago-style hot dog done right, the Vienna Beef factory store has a gift basket you might want to check out. Stamped with a $19.95 price tag, the Vienna Beef gift basket has (almost) everything you need to assemble an authentic Chicago-style hot dog. Inside you'll find classic beef franks, jumbo franks, celery salt, kosher dill pickle spears, sport peppers, Chicago-style relish and mustard. You'll just need to get the buns, tomatoes and onions. Vienna Beef also threw in a 2-pound portion of salami, a mini version of the 5-pound portion you'll find at the deli. The factory store is across the street from the longtime Chicago company's new manufacturing and distribution facility. The 1,700-square-foot shop at 3847 S. Morgan St. is open from 9 a.m.-4 p.m. weekdays and from 10 a.m.-4 p.m. Saturdays. The hot dog stand is a pared-down version of Vienna Beef's factory cafe at 2501 N. Damen Ave. Though the company decided to move its manufacturing facility to the South Side, the original factory store remains in Bucktown.